It’s time for us to drive north again. We’ve lingered in Victoria ever since we arrived on the ferry from Tasmania in March, and now the weather and friends are calling us to northern NSW and southeast Queensland. Our time in and around Melbourne has been exceptionally good — mostly because we’ve spent so much time at the home of some dear friends. 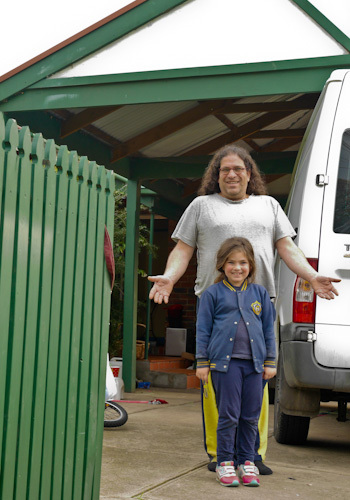 Hagai and his daughter Tali have shared their home with us since early April, and we've loved being part of their lives! Living alongside a schooling family has been a new experience for us. The girls have become meaningfully aware of days of the week and times, simply so they can keep track of Tali’s schedule! We transitioned into loose bedtimes so as to allow Tali a full night’s sleep and discovered new foods as prepared by Hagai. There were challenges with the constant anti-lice treatments and occasional clashes among the five girls, but mostly our lives meshed effortlessly. It’s been wonderful to have a place for the girls to create wild paintings and elaborate games that last for days. “School” was a definite favourite — with Tali as the teacher, giving lessons on a blackboard! We welcomed the constant flow of other visitors to the Erman residence, and I appreciated the opportunity to grow my friendship with Hagai through many long talks about conscious relationships, parenting, worldviews and Confest. 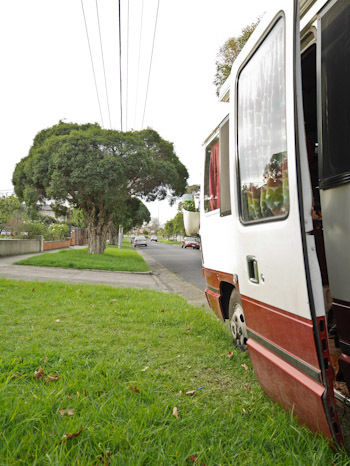 We've been parking on the side of a suburban street for several months — quite a difference from our usual bushy campsites! I loved the neighbourhood around the Ermans’ house and enjoyed the opportunity to take walks by myself — something I used to routinely do before having children. I even fell in love with Melbourne and all that it has to offer — although I do believe we’re skipping out before the weather turns unfriendly! The only way we could drive away from Hagai and Tali is with the promise that we’ll be back. It’s been a wonderful time in Melbourne, we’re indebted to their hospitality and enriched by their friendship — there’s no way we’ll stay away!